Reduces the effects of heat soak. What can you do to get rid of this heat soak? 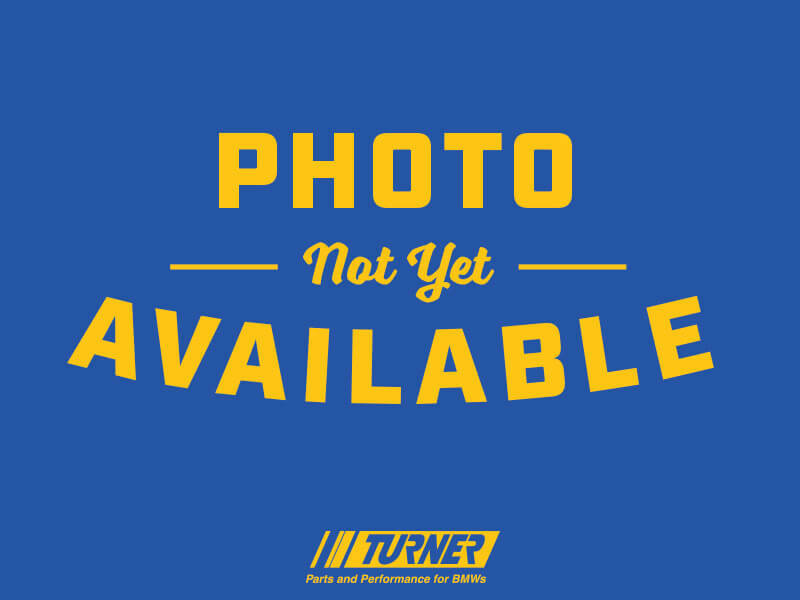 Turner designed an IAT relocation kit that moves the intake air temp sensor to a cooler location. Mounting the sensor further away from the heat source and isolating it from the MAF housing, it can both resist the effects of heat soak longer and respond to temperature changes more quickly. The result is youaEURtmll experience reduced torque loss and more consistent power output when youaEURtmre pushing your engine hard. More power = more heat. It's easy to make more power one time but to continue making that power consistently requires careful planning and design. With the additional boost the air entering the engine is also warmer, making the intercooler more important than ever. In testing, the stock BMW intercooler was quickly overwhelmed and cannot keep the intake air cool enough. The engine computer recognizes that and dials back the boost. A more efficient intercooler will keep boost levels up, delivering consistently higher boost levels. The Stage 1+ package includes a Wagner Evo I plug and play intercooler upgrade. We get great feedback from our customers and technicians about the Wagner FMIC - it's a direct bolt in part using all of the factory piping and it offers 85% more surface area than the factory intercooler. The aFe Dual Cone intake and Cobb Accessport programmer complete the Stage 1+ package. The larger surface area of the aFe cone filters allows more air to enter the engine - creating more power and torque, a richer engine sound, and better throttle response. The kit is supplied complete with aFe Pro5R filters, mounting shield, intake tubes, sealing materials, hardware, and install instructions. The torque increase and sound from the open intake from low-mid RPM is sensational. The Cobb software tool puts multiple tuning stages in the palm of your hand. Our Stage 1+ package lines up with the Cobb Stage 1 tuning maps for an intake and FMIC (91 or 93+ octane fuel). Simply download the Stage 1+ map from the Cobb website, plug it in, and install. Select different maps for other upgrades, throttle settings, octane ratings, valet mode, or revert back to stock! If you're moving up in Stages simply download a new file from the Cobb website and update your AccessPort programmer! The AccessPort triples as a diagnostic tester/reader and a data logger. It's the most feature-packed programmer on the market today. We have taken the guesswork out of choosing the best upgrades for the N54 engine. If you follow the upgrade path we have laid out you will have very satisfying and reliable results. The addition of the larger intercooler makes Stage 1 more enjoyable and won't let you down at the track or dragstrip. * Note that peak power gains are quoted remain the same as Stage 1 but the cooler intake air means there is less of a chance the engine computer will cut power from heatsoak. Our Stage 1 kit features a cold-air intake kit and performance software for a staggering increase in power and torque. This premium package is offered with the aFe Elite Intake and Cobb AccessPort tuner. The Elite intake kit completely maximizes airflow - drawing in air from grille-mounted ducts for a 'ram-air' effect. Each duct flows through a channel into the airbox where it meets a aFe Pro5R filter designed especially for this application. This is our favorite system for the 335 as it is very well engineered, fits well, and almost looks factory. There are no open filter elements to get loaded with dirt. The kit is supplied complete with an aFe Pro5R filter, airbox, intake tube, sealing materials, hardware, and install instructions. The torque increase from low-mid RPM is sensational. We have paired the aFe Elite with the Cobb AccessPort performance software. The Cobb software tool puts multiple tuning stages in the palm of your hand. Our Stage 1 Performance Package is aligned with the Cobb Stage 1 tuning map. Simply plug it in, select the Stage 1 map with your octane preference, and install. Select different maps for other upgrades, throttle settings, octane ratings, valet mode, or revert back to stock! If you're moving up in Stages simply download a new file from the Cobb website and update your AccessPort programmer! The AccessPort triples as a diagnostic tester/reader and a data logger. It's the most feature-packed programmer on the market today. We have taken the guesswork out of choosing the best upgrades for the N54 engine. If you follow the upgrade path we have laid out you will have very satisfying and reliable results. This Stage 1 package is a great 'bang for the buck' upgrade - this power kit makes more power and torque at every RPM and makes a great sound every time you dip into the throttle. Our Stage 1 kit features a cold-air intake kit and performance software for a staggering increase in power and torque on the N54 motor. We offer this package with the aFe Dual Cone Intake (DCI) to open up the breathing. The larger surface area of the filters allows more air to enter the engine - creating more power and torque, a richer engine sound, and better throttle response. The kit is supplied complete with aFe Pro5R filters, mounting shield, intake tubes, sealing materials, hardware, and install instructions. The torque increase from low-mid RPM is sensational. We have paired the aFe DCI with the Cobb AccessPort performance software. The Cobb software tool puts multiple tuning stages in the palm of your hand. Our Stage 1 Performance Package is aligned with the Cobb Stage 1 tuning maps (91 or 93+ octane fuel). Simply plug it in, select the Stage 1 map with your octane preference, and install. Select different maps for other upgrades, throttle settings, octane ratings, valet mode, or revert back to stock! If you're moving up in Stages simply download a new file from the Cobb website and update your AccessPort programmer! The AccessPort triples as a diagnostic tester/reader and a data logger. It's the most feature-packed programmer on the market today. We have taken the guesswork out of choosing the best upgrades for the N54 engine. If you follow the upgrade path we have laid out you will have very satisfying and reliable results. This Stage 1 package is a great 'bang for the buck' upgrade - this power kit makes more power and torque at every RPM and makes a fantastic snarling sound every time you dip into the throttle. Note that peak power gains are quoted above but this package has even bigger performance gains in the lower RPM! INSTANT POWER GAIN WITH NO DOWNSIDE! Turner's Stage 1 performance package for E90, E92, E93 M3 delivers a one-two punch with the easiest no-downside upgrades for the S65: Turner Stage 1 Performance Software and Power Pulley. Get MORE HORSEPOWER and TORQUE on your 2008, 2009 and newer M3 coupe, sedan or convertible by replacing the stock crank pulley with this specially designed performance version. The Power Pulley reduces rotational mass and safely under drives your belt driven auxiliaries for reduced parasitic power loss. The end result: More power to your M3's rear wheels! Designed to give the best performance benefit with no sacrifices or compromises to your BMW's reliability. These have been tested on hundreds of cars before public release and there are simply NO DOWNSIDES to this upgrade. CNC machined using aircraft grade 6061 aluminum billet, and anodized with a stealthy black coating. Others may advertise "their" crank pulley boasting higher numbers (using a smaller pulley profile), but we have concluded that for street and track driven M3s, this is the best size and design to ensure proper engine temp and auxiliary functionality. As the S65 M3 V8 engine doesn't use a traditional harmonic balancer, all factory harmonics and dampening are fully and properly retained. We've found this pulley alone adds 10 to 14 HP and 7 to 9 Ft/lbs Torque on a stock M3 with no other mods(!!). Adding power and torque to your M3's V8 is as easy as a flash! Where we can make our software better is by tuning it for higher octane gasoline. The stock software is tuned around the 87 octane available in the US (not that most people would use 87 but BMW engineers must account for that possibility). With our software, the performance of the S65 engine is optimized for the higher 91 or 93 octane. We tune many areas of the engine programming - fuel and timing maps at part throttle and wide-open throttle, revised torque settings and knock control, and more. The throttle response is also improved (quicker and smoother) eliminating unwanted and dangerous flat spots in the factory pedal response. We also offer raised rev limits and the top speed is raised/eliminated. Our software uses the factory 240E update as a base. The 240E has several major enhancements over previous factory file versions. No worry if you don't have 240E - we will provide you with a free update before the Turner performance software is installed. If you have other modifications done to your M3, we can supply you with specially-developed software to maximize the gains from those upgrades. 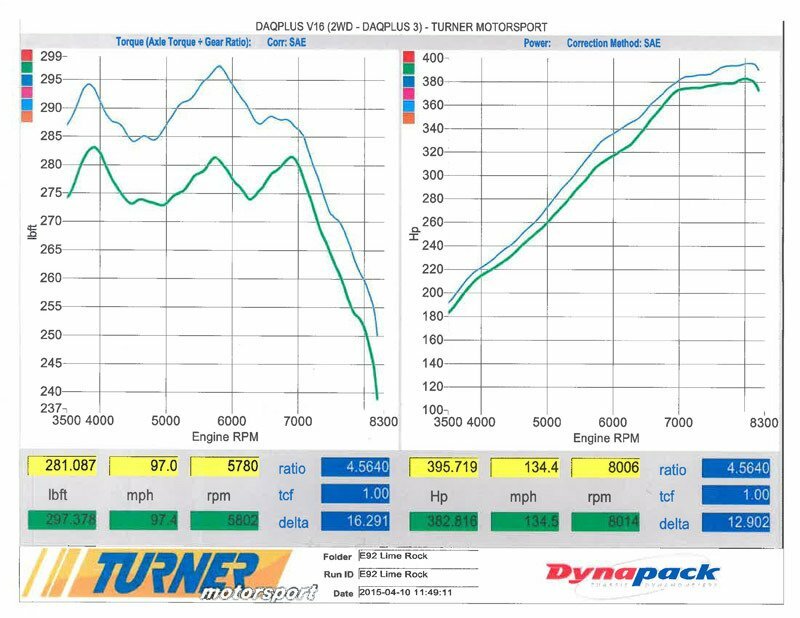 See our dyno sheet for our Stage 1 performance tune - no Turner pulley on this car! If you want to get the most out of your BMW's N55 3.0L, it is important to have the proper supporting modifications to achieve your goals. We have built out our power packages that include all the needed items to build upon each other for the best possible power gains.&Newline; &Newline; This kit includes all of the similar components as the Stage 1 kit: a Pheonix Racing aluminum performance charge pipe for increased flow and a Burger Motorsports JB4 tuner module to manage your power gains every step of the way.&Newline; &Newline; Stage 2 adds the Wagner EVO 2 intercooler that allows for a 90% increase in airflow volume. To handle this increase in airflow, Stage 2 also includes a new BMS Intake to increase airflow without restriction.&Newline; &Newline; Not for sale or use in the state of California. If you want to get the most out of your BMW's N55 3.0L, it is important to have the proper supporting modifications to achieve your goals. We have built out our power packages that include all the needed items to build upon each other for the best possible power gains.&Newline; &Newline; This kit includes all of the similar components as the Stage 2 kit: a Pheonix Racing aluminum performance charge pipe for increased flow, a Burger Motorsports JB4 tuner module to manage your power gains every step of the way, a Wagner EVO 2 intercooler, and a BMS high flow intake.&Newline; &Newline; Stage 3 adds a Wagner catted high flow downpipe to increase exhaust flow for maximum power.&Newline; &Newline; Not for sale or use in the state of California. If you want to get the most out of your BMW's N55 3.0L, it is important to have the proper supporting modifications to achieve your goals. We have built out our power packages that include all the needed items to build upon each other for the best possible power gains.&Newline; &Newline; This kit includes a performance K&N air filter to eliminate the first point of possible restriction, a Pheonix Racing aluminum performance charge pipe for increase flow, and a Burger Motorsports JB4 tuner module to manage your power gains every step of the way.&Newline; &Newline; &Newline; &Newline; Not for sale or use in the state of California.